​I am so excited and honoured to be able to offer this class in support of our fellow sisters in need. Please join us for this VERY SPECIAL Yoga 4 Dignity class. Share the Dignity collects thousands of pads, tampons and personal hygiene products every YEAR for women experiencing homelessness and poverty. They also fund funerals for victims of domestic violence and campaign for justice for women in Australia. It means we can make a difference to homeless women and victims of domestic violence. #Yoga4dignity will bring thousands of women from Australia together to share the dignity while at the same time opening our hearts and touching our toes. 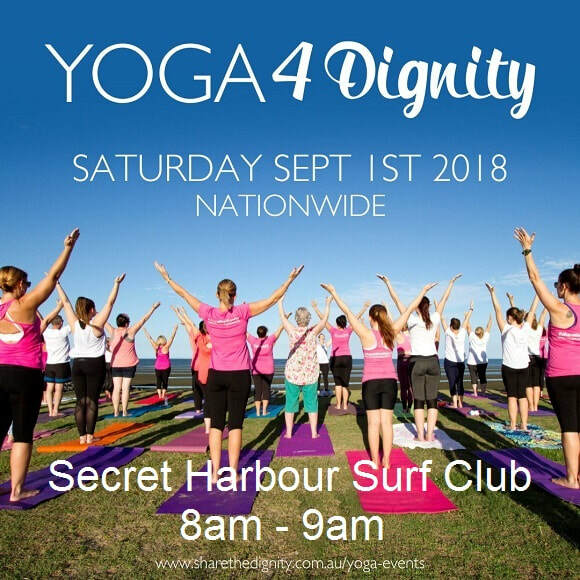 In Australia we have 48,000 homeless women and it is our GOAL this year to have the same number practising YOGA in your hometown as we #Yoga4Dignity. This class will be held on September 1st September 2018 at 8am at the Secret Harbour Surf Lifesaving Club, Palermo Cove, Secret Harbour. The class will be a Hatha yoga class. Suitable for ALL levels so bring your ALL your soul sistas !! Light refreshments provided after class, so you are more than welcome to stick around and connect with each other. Let's come together as the amazing community that we are and show our support for this cause. ​Tickets are $20 with ALL proceeds donated to Share the Dignity. So excited to be a part of this amazing 2 day festival. NEXUS is a celebration of everything that is closest to our hearts – Health & Family. - 15 International speakers including Tyler Tolman, Inna Segal, Julian Pace, Stef Sifandos and more. We all have a deep desire to connect and contribute which is why at Nexus we have over 40+ exhibitors and 15 International Speakers dedicated to teaching you and your families the tools for optimal health & wellbeing as a PREVENTATIVE tool to live life on your terms. NEXUS is creator Mark Reid’s "BABY" and is the physical embodiment of his life purpose which is to design an online curriculum for parents and kids to home school; enabling a life of deep connection, freedom and love. Nexus means “a connection or series of connections linking two or more things.” and exists to connect and upgrade our current, broken healthcare and education systems which are developing humans that are destined to succeed in a reality that is failing us all. We have never had more readily available information and knowledge. Yet cancer, diabetes, stroke, heart disease, Alzheimer’s, diabetes, depression, anxiety, PTSD, OCD, suicide, divorce, juvenile delinquency are all on the rise. We run around aimlessly disconnecting from what we really love - our family and friends to instead impress people we don’t know on a phone that is “smart”, dedicating our lives to a job we don’t like, to pay for a house, car and amenities we can’t afford, in minds and bodies that we don’t appreciate and nurture, all wishing that life would be somehow different. Nexus will instead educate you on the framework for the future for you and your family's health and happiness from some of the greatest minds in the world. Kids UNDER 16 are completely FREE and we have a whole dedicated kids section where they can enjoy Dancers, Music (DJ & Live Band), Bouncy Castle, Face Painting, Balloon Twisting, Arts & Crafts, Petting Zoo and more allowing parents to take time for themselves with ZERO GUILT or worry. There are no 2 stalls the same and we have everything from energy healers to massage therapists, organic farmers market produce to chiropractors, yoga to martial arts, bioresonance therapy to Ayurveda. If you can think of it, we have it and we are giving it to you for FREE plus a $5 donation. This really is the go to event in WA for Family Health and we can’t wait to see you there as we start a movement from our home city that is destined to change the way we live for the good of our own family, theirs and families around the world. So excited to confirm the dates for our 2019 March Yoga Retreat!! These 'homegrown bush retreats' are a way of celebrating our local talented teachers & healers whilst immersing ourselves in the stunning surroundings of our beautiful Southwest. Running twice a year in March & October. Yoga, yoga & more yoga, sound healing, chanting, Thai massage, swimming, walking, getting creative, learning, growing, healing, laughing and all in the beautiful surrounds of Dwellingup's Nanga Bush Camp. This is an opportunity to disconnect from our busy lives and reconnect with ourselves & MOTHER NATURE! We don't have to go overseas to hold a great retreat, we have the amazing South West right at our doorstep! And we can make it affordable for EVERYONE!!! To keep costs down each guest is asked to supply their own meals (2x breakfast, 2x lunch & 2x dinners). A fully equipped kitchen is available for everyone to use. A deposit of $75 is required to secure your place. Please note NO REFUND if change of mind. You are committing yourself to an event for fun, yoga and lots more, a chance not to be missed. Easy payment plans can be arranged. 32 guests maximum - and already 8 spots booked after last weekends retreat. That means there are only 24 spots remaining. Reservations are confirmed upon payment of the deposit. Please make transfer into the following bank account. Please leave FULL NAME on transfer and email proof of payment to lisa@ourcommunityyoga.com.au. I will email a receipt once payment has been cleared. The camp is flexible, at your leisure. Join all classes, join some classes or if you just want to totally retreat join no classes. This is your space to do what you wish. Closing Gratitude Circle and tree-hugging!!! I am personally so excited to offer this retreat and honored to be working alongside some of Perth's leading teachers and healers. Hoping to hugs some trees with you in March!! ​Join us for a lovely morning full of mindful walking, yoga, meditation, laughter and a light lunch. Bring your yoga mat & bottle of water and meet in the carpark at 8am. We will have a short light hearted 'meet & greet' and then depart on our yoga adventure! Walking along the pristine coastline of Point Peron, appreciating the fresh ocean air, celebrating the warm sunshine and connecting with nature, we make our way one of the many beautiful beaches, roll out our mats and enjoy a gentle yoga practice. Don't worry if you've never done yoga before, beginners are warmly welcomed and encouraged.... You'll be fine!! After our yoga, I will take you through a guided meditation and we will take a moment to pause....... relax....... and just BE!!! You will have some free time to explore before heading onwards to our meeting place for a light lunch. Fresh cut fruit and light snacks will be provided, but if you'd like to bring your own picnic feel free, maybe even a plate to share! We finish with a little laughter and a gratitude yoga flow and celebrate the connections we've made..... with ourselves, each other & nature!